385 Beacon is located on the south side of Beacon, between Fairfield and Gloucester, with 383 Beacon to the east and 387 Beacon to the west. 385 Beacon was designed by architect Frederick B. Pope and built ca. 1869, one of ten contiguous houses built as five symmetrical pairs (377-379-381-383-385-387-389-391-393-395 Beacon), each house on an 18 foot wide lot and each pair united by a shared portico. 377-379 Beacon are one story higher than the other four pairs, and probably were built that way (they appear as such on the 1887 Sanborn map). Click here for an index to the deeds for 385 Beacon. On October 1, 1869, 385 Beacon was purchased from George Gibson by John Whitney Beals. He and his wife, Virginia Arabella (Simmons) Beals, lived at 211 Beacon. On the same day, he conveyed the property to Miss Helen McClees of New York City, the daughter of iron merchant William Kennard McClees and his wife, Sarah A. (Clark) McClees. John Beals probably had purchased it on her behalf, acquired by her in anticipation of her marriage in January of 1871 to Samuel May, Jr. After their marriage, they made 385 Beacon their home. Samuel May, Jr. was a hardware and metals dealer in his family’s firm. Prior to his marriage, he had lived in Dorchester with his parents, John Joseph May and Caroline Simpkins (Danforth) May, and his grandparents, Samuel Joseph May and Mary (Goddard) May. He was known as Samuel, Jr., probably to avoid confusion with his grandfather. Samuel and Helen May lived at 385 Beacon until about 1874, when they moved to Dorchester to live with his parents (his grandfather had died in February of 1870). On November 24, 1874, 385 Beacon was acquired from Helen May by Samuel May’s brother, John Pierpont May, a paint dealer. He and his wife, Rebecca (Clymer) May, lived in Dorchester. By 1876, it was the home of banker Charles Emerson Fuller and his wife, Josephine (Wheildon) Fuller. They had lived at the Hotel Vendôme in 1875. They continued to live at 385 Beacon in 1878, but by 1879 had acquired and moved to 304 Beacon. 385 Beacon was not listed in the 1879 Blue Book. On March 13, 1880, 385 Beacon was acquired from John P. May by Elizabeth Greenough (Lewis) Gay, the widow of Dr. George Henry Gay, who had died in August of 1878. Their three sons – Frederick Lewis Gay, George Henry Gay, Jr., and Ernest Lewis Gay – lived with her. They all previously had lived at 321 Marlborough. During the 1884-1885 and 1885-1886 winter seasons, Elizabeth Gay was traveling in Europe with her two younger sons, George and Ernest. Frederick Gay moved to 43 Mt. Vernon and then to Chicago to join the treasurer’s office of the Atchison, Topeka & Santa Fe Railroad. 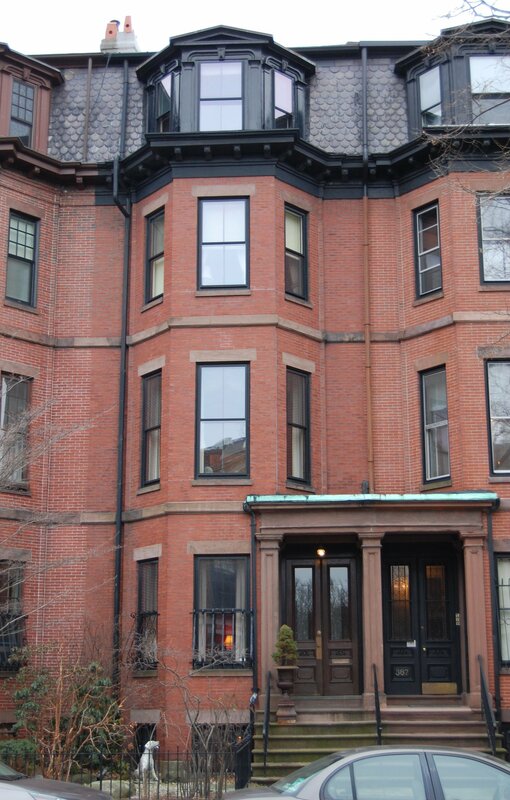 In June of 1889 he married Josephine Spencer; after their marriage, they lived at 84 Beacon and then in Brookline. He was a genealogist and historian. During the 1884-1885 season, 385 Beacon was the home of Catherine (Jarvis) Hunt, the wife of Leavitt Hunt, and their son, Jarvis Hunt, an architect. Their primary residence was in Weathersfield, Vermont. 385 Beacon was not listed in the 1886 Blue Book. Elizabeth Gay and Warren and Ernest Gay had resumed living at 385 Beacon by the 1886-1887 winter season. Warren Gay, a surgeon, married in June of 1904 to Ellen Freeman Stickney. After their marriage, they lived at The Marlborough at 416 Marlborough, where he also maintained his medical office. Elizabeth Gay and Ernest Gay continued to live at 385 Beacon. He was an antiquarian and book collector. 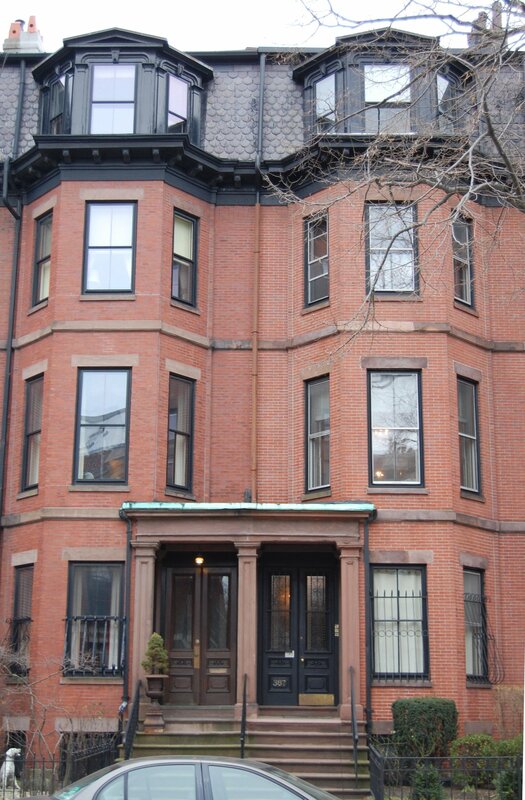 After her death, Ernest Gay moved to 317 Marlborough and 385 Beacon became the home of Warren and Ellen Gay. He continued to maintain his medical office 416 Marlborough. On December 31, 1915, Warren Gay transferred his interest in 385 Beacon to Ernest Gay. 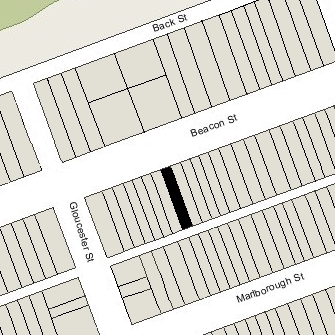 Warren Gay died in August of 1916 and Ellen Gay moved to an apartment at 409 Marlborough. 385 Beacon once again briefly became Ernest Gay’s home. He died in November of 1916 on the special Harvard Train returning from the Harvard-Yale football game in New Haven. 385 Beacon was inherited by Warren and Ellen Gay’s son, George Henry Gay. 385 Beacon was not listed in the 1918-1921 Blue Books. By the 1921-1922 winter season, Ellen Gay and George Gay had made 385 Beacon their home. They previously had lived at 9 Massachusetts Avenue. She also maintained a home in Edgartown and later in Marblehead. George Gay continued to live at 385 Beacon until his marriage in 1934 to Doris Louise MacCalmon. After their marriage, they lived in Marblehead and then Southborough. 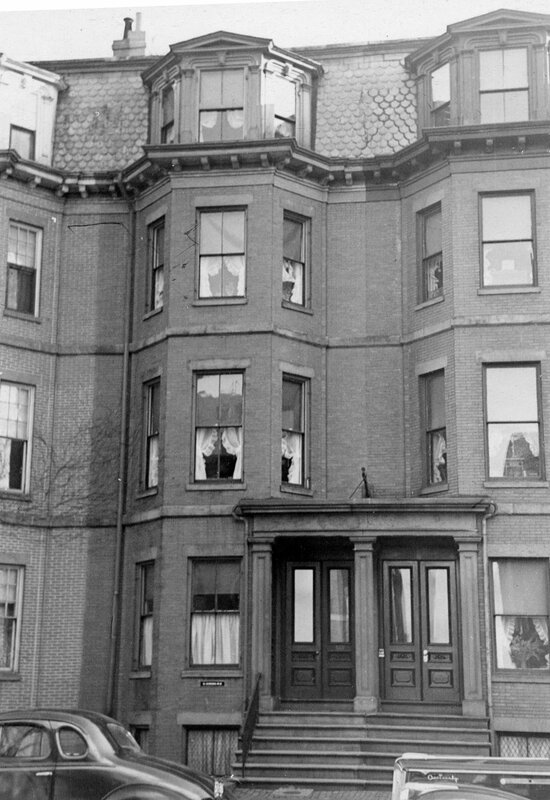 Ellen Gay continued to live at 385 Beacon until about 1938, when she moved to Southborough to live with George and Doris Gay (she died there in January of 1939). On April 11, 1938, 385 Beacon was acquired from George Gay by Agnes Mary (Amerault) Simons, wife of Dr. Sigmund Simons, a physician. Sigmund and Agnes Simons lived in Westford and he initially used 385 Beacon as his Boston office. In the late 1940s, however, they moved to 385 Beacon and it became their home as well. They subsequently maintained residences in both Westford and at 385 Beacon. Agnes Simons died in February of 1965, and Sigmund Simons died in July of 1995. On June 17, 1996, 385 Beacon was purchased from Sigmund Simons’s estate by Ann M. Geupel, trustee. 385 Beacon remained a single-family dwelling in 2017.